Looking for foreign language books? Biblio.com hosts over 5500 of the finest online book stores and booksellers, including specialists in foreign language. Use the list below to locate a specific specialist bookseller or book store near you. Or, use the form below to search the inventory of all booksellers who specialize in foreign language. Books and Bobs, Family Business; Individual Attention; Really Excellent Service; Search for any book; Transported to your door. Books and Bobs FIRST for Books. We are a family run business that was launched to provide quality second hand books. We pride ourselves in the fast service that we offer, together with the quality of the books we sell. We have over 6,000 books in stock, across all genresIn 2017 we started selling Vinyl LPs and have over 2000 in stock. We also offer a search facility, where we will use our network of booksellers around the world to try and find that elusive book for you. We charge a set fee of £4 for every book that we find and you subsequently buy. When you purchase your books from BooksForTheNeedy.com you are helping make the world a better place. Your purchase creates funding for small non-profits who help lift up the world and those who are hurting in it. Operated as an outreach program of Revelation Spiritual Church in Cincinnati Ohio, the funds go to 2 food banks, a literacy program, an animal-rescue organization, 2 struggling churches, a small rural catholic school, 8 small libraries whose budgets have been slashed, and 2 small college libraries with budget problems. In addition the funds support a housing program for abused women, a cancer-wellness center and a foundation dedicated to spreading information about Feldenkrais. Thank you for your interest. New, used, out of print, collectible books in all subject areas, for adults and children. Thanks so much for visiting ElevenElevenBooks, a home-based online bookstore fueled by a family of 6! For over 10 years we have been one of the top sellers in the antique book category on eBay and have now started to spread out onto other platforms. With over 17000+ positives in 8 years, as well as 100% positive feedback on ebay, we are trustworthy, knowledgeable and the go-to for the thousands of return customers we maintain. Simply put-antique books/ephemera are our livelihood & passion. From us to you, we hope you find your next treasure and continue its reverie within your home. Specializing in antiquarian, collectible, scholarly, and rare books of all genres. Brick and mortar used book store located in Bethel, in the southwest corner of Connecticut, for 20 years. Come visit our store! 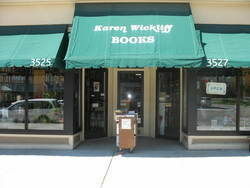 (directions at www.rainydaypaperback.com) Walk around our downtown of small shops and great places to have lunch.